President Obama today announced a $3.8 trillion budget proposal that includes $50 billion to create jobs and a more than 6 percent increase in education funding. WASHINGTON (CNNMoney.com) - President Obama revealed a $3.8 trillion budget for 2011 on Monday that tries to balance two competing goals: continued government spending to boost the fragile economic recovery and controlling the nation's deficit. Actor George Clooney is getting plenty of Oscar buzz for his role as a downsizing consultant in the new movie "Up in the Air." The film tackles an issue millions of Americans are very familiar with right now – unemployment. Movie-goers may not realize it, but many of the laid-off workers in the film aren't actors, they're real people who lost real jobs. Kevin Pilla, Arthur Hill and Marlene Gorkiewicz all appeared in "Up in the Air," and they joined us on Monday's American Morning. The Obama administration is doing what so many families have already been forced to do: make tough choices with their money. The president's $3.8 trillion budget is heading to Capitol Hill today. It calls for billions of dollars to create jobs, but it freezes spending for other domestic programs. Republicans like House Minority Leader John Boehner are saying it's a good start. 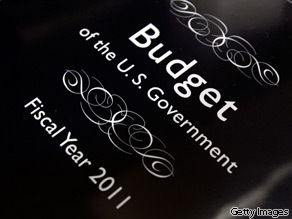 President Obama's budget director, Peter Orszag, joined us on Monday's American Morning. After recalling millions of cars and trucks, Toyota is breaking its silence this morning. On the table now is a plan to fix the faulty accelerator pedals with new parts already shipping to dealerships. But is that enough for millions of Toyota customers or just too little, too late? Jim Lentz, president and chief operating officer for Toyota Motor Sales USA Inc., joined us on Monday's American Morning to answer questions. When President Obama took office a little more than a year ago, the economy was on life support. One year and a $787 billion shot in the arm later, the economy is growing again but job losses persist– unemployment hovers at a painful 10 percent. As the president begins year two of his term, he vows to roll out new programs to spur job creation. But how soon? Our Christine Romans reports. The ladies owned the night at the Grammys yesterday. Beyonce lived up to her album title, "I am Sasha Fierce," taking home a record-breaking six trophies. But country singer Taylor Swift's "Fearless" scored the night's biggest prize. And an emotional tribute to the late pop legend Michael Jackson was the first-ever 3D performance at an awards show. From the red carpet to the final curtain, our Kareen Wynter has the full breakdown from Hollywood.